2 kids abducted in Nevada 9 years ago found in Wis.
RUSSELL, Ill. (WLS) -- Two people accused of abducting an infant and child in 2006 in Nevada have been arrested in Illinois. The children, now 9 and 14, were found in Pleasant Prairie, Wis., police said. 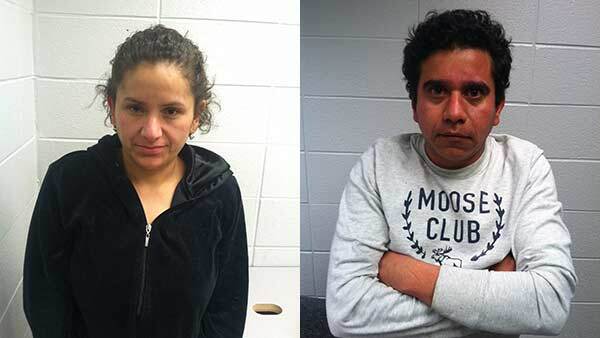 At 11:20 p.m. Tuesday, a Lake County, Ill., sheriff's deputy on patrol spotted what he described as "suspicious activity" in the truck parking lot of the Truckstops of America in unincorporated Russell, Ill. That led to the arrest of Maria Rosaline Malagon-Castillo, 40, and Manuel Ruiz-Garcia, 39. Both were wanted on outstanding arrest warrants in Las Vegas in connection with the abduction of their two children in 2006. Neither parent had custodial rights and the children were in state custody, officials said. Lake County Sheriff's deputies found the children at a home in Pleasant Prairie, Wis. Police say both children were deemed wards of the state of Nevada in 2006. But police say the parents fled Nevada with the two children to avoid an investigation into an allegation of drug abuse during pregnancy by Malagon-Castillo. The children are now with a family member with the permission of the Clark County, Nevada, Department of Family Services pending review of the case in Nevada Wednesday. Ruiz-Garcia and Malagon-Castillo are being held at the Lake County Jail without bond pending extradition to Nevada. Police say Ruiz-Garcia, a truck driver, also had a fake Nevada commercial driver's license that had been suspended.